This one I’ve seen before. A spirit from the Dreamtime. Aborigines believe in two forms of time – two parallel streams of activity. One is the daily objective activity to which you and I are confined. more real than reality itself. and laws of Aboriginal society. Some people of unusual spiritual powers have contact with the Dreamtime. What is the name of that spirit? in Sydney. – Now extinct, of course. bringing sacred objects with them like these stones. You mean, they’re sometimes human? Yes, the local belief was that they acted through humans. that tribal people expect from Mulkurul. You see, a Mulkurul has incredible premonitory dreams. They usually appear at the end of a cycle when nature has to renew itself. Most primitive cultures see life in cycles. Each cycle ends with an apocalypse of some kind. Are you a snake? Are you a man? Who are you? Who are you? Who are you? Who are you? Who are you? Who are you? Are you Mulkurul? Synchronicity is a powerful force that drives us in many different directions. These connections have brought me to people, places, things, and ideas that would have remained hidden otherwise. New discoveries only lead to more and more questions. I wonder who or what is weaving these connective fibers. Are we all playing our parts in a technologically-enhanced hive mind that utilizes our organic bodies? Could it be that synchronicity is a way for the divine to reach into our daily, waking lives? If so, who is this “god” of Syn-Cron-I-City? How can we know that these syncs are really signs (sines) and not “sins”? A good understanding of our language can be a useful tool in seeing how our reality is constructed. A nice example of this is how people are lured into movies, allowing for the reel to become real. Some may disagree with me concerning the nature and intention of cinema (sin-a-ma), but its power in terms of culture creation and MeMe-generation cannot be denied. Obviously not every film is created equal, and there are some diamonds in the rough, but many movies will use universal themes and plot-lines in order to draw in the viewer whilst implanting loads of hidden content. In my opinion, much of the synchronicity found in movies is actually carefully crafted connection, some of which is meant to be uncovered eventually, like Dark Side of The Moon syncing with The Wizard of Oz. This is a spell that has been cast. Instead of discussing a lot of movies, I would rather break apart the English language and how it was Engineered. 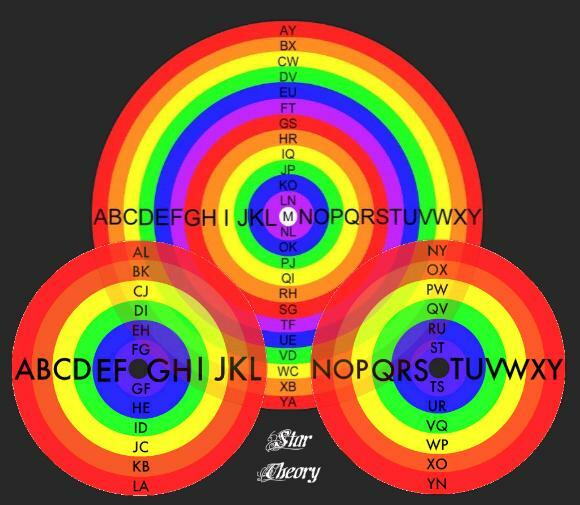 I go over The Rainbow Alphabet in a brand-new book.. The Sync Book is now available! 26 bloggers/writers/artists share their experiences and perspectives on the strange and beautiful universe in which we live. I would like to thank everyone involved for helping to inspire my thought and giving my ideas some fer-tile soil/sol with which to grow. This most certainly includes you, my dear reader. On September 9th, I had Dennis Fetcho from the return to Star Theory radio for a fascinating discussion. Here’s the promotional video for the show..
And you can listen to the show in the archives..
Perhaps you noticed that the show was preceded by an uprising in Egypt, in which Israel had their embAssy surrounded by hundreds of thousands of angry people, resulting in a forced evacuation. Earlier this month, Turkey forced Israel’s top diplomats from their embassy in AnkAra. Israel has still not apologized for last year’s incident in which Israelis boarded a Turkish vessel sending aid to Gaza and then slaughtered a number of unarmed activists. So why don’t we hear more about Israel’s crimes against humanity? ADL. Break it down. A is 1, D is 4, L is 12. Some sync fans should know that 1412 could be combined to form the alchemical symbol for Jupiter (JewPiTyr). 1412 also reminds me of a famous Bible passage.. The clues and codes are there for us if we are discerning intelligent. For example, what does the ADL do? Verb: Make unable to think clearly; confuse. Adjective: (of an egg) Rotten. Did these Jews choose this name on purpose or were other forces at play? For me, it has become difficult to see what is planned synchronicity (people taking my work and reflecting it back to me) and what is the naturally occurring connective fabric of the universe. Is there much of a difference? Does it even matter? Okay, so the person who chooses those daily words is named Anu Garg, so take from that what you will. ReGardless of this one instance, I’m certain there are more than a few unannounced, influential fans of Star Theory and my BRainBow. 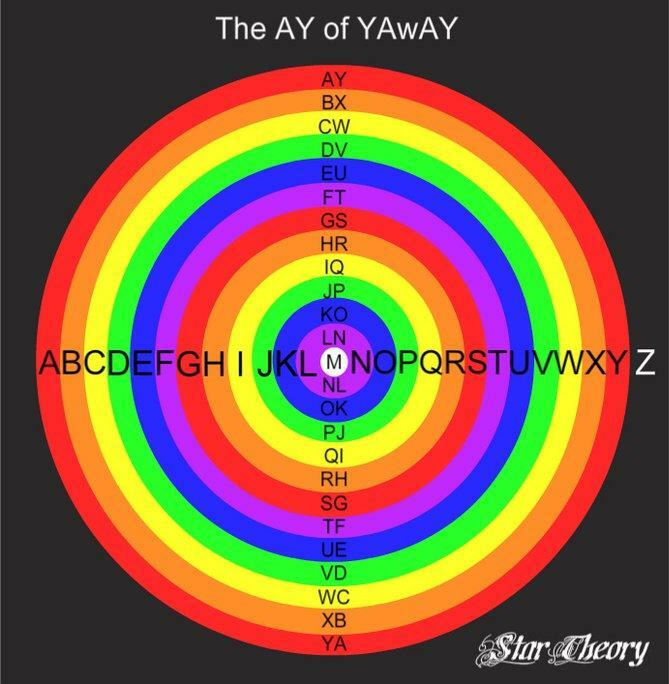 Our Alphabet encodes SacRed geometry and includes the different hues of humanity, representing many different religious traditions and symbols in beautiful simplicity. Can knowledge be used to unite the tribes of humanity, liberating ourselves from DiviSion? What happens when the big secrets are brought to light? I have made some jokes about people thinking I am the Mahdi and called myself King Kyle, but what if others are starting to believe the hype? Greetings! I will be having Dennis Fetcho from The Illuminatus Observor back on Star Theory Radio on Friday, September 9th at 11 PM Eastern. Hopefully through our conversation, some solutions to our current crisises will become apparent. 38 and 39 of the Book of Ezekiel: Son of man, direct your face towards Gog, of the land of Magog, the prince, leader of Meshech and Tubal, and prophesy concerning him. Say: Thus said the Lord: Behold, I am against you, Gog, the prince, leader of Meshech and Tubal. Many of you have likely heard that George W. Bush’s nickname from Skull and Bones is Magog. It seems the Bush family is well liked at the synaGOGues..
And now we have a new presidential candidate, Sarah Palin, who wears an Israeli flag pin and wonders why these criminal Jews apologize so much. We will be discussing these issues and so much more. Be sure to listen & chat live..